Today London’s beloved superclub, Fabric, announced that it’s house is once again in order and banished woeful tales of administration. 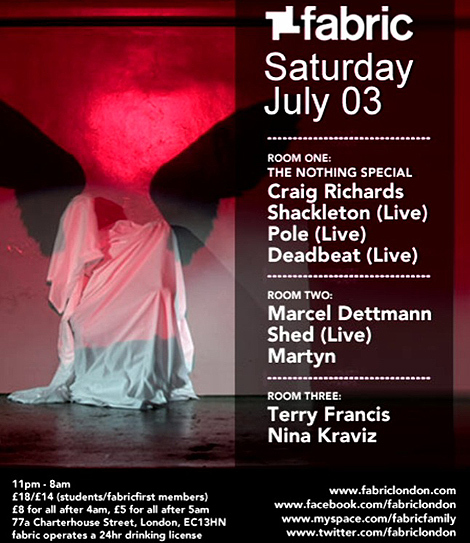 In case you need proof that it’s business as usual, check out the line up for July 3rd: Room one hosts The Nothing Special, with live performances by Shackleton, Pole, and Deadbeat, and a DJ set from resident Craig Richards. Room two features Marcel Dettmann, Shed (live) and Martyn. Room three rounds out the line up with Nina Kraviz and resident Terry Francis. Since we can’t attend, we’re sending you and a friend in our stead. All you have to do to win two tickets is correctly answer our trivia question: On what label did Shackleton make his vinyl debut? Send your answer (with “NOTHING SPECIAL” in the subject) to editor[at]littlewhiteearbuds.com by July 1st at 10am CST. One winner will be chosen from correct responses and notified by email. Good luck! Stop posting your answers in the comments! Read the instructions!